Ryan Tysdal, who played baritone in the Phantom Regiment from 1996 to 2000, sent in this shot. "Here is a picture of the Phantom Regiment soprano line taken before the Greeley, Colo., show. On the left end is this year's horn sergeant, Allison Scallan. Next to her is four-year veteran, Joe Huls. "While in Colorado for a couple shows, I was able to see many old friends from the corps, both current members and alumni. It's amazing how you can be thousands of miles apart for months (or years) at a time from your old friends, and it's like you never missed a beat when you come together again. 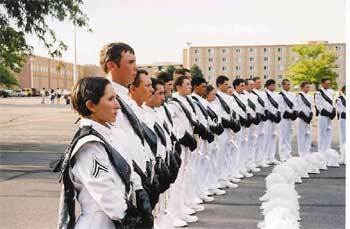 Thank you Phantom Regiment." Thanks Ryan! E-mail your Forzato submissions -- and we will get to them all, in time -- to dave@dci.org along with where and when the photo was taken. Send some biographical information about yourself as well. We'll give you full credit. Also, let us know if you want your e-mail address included, to get feedback from other drum corps fans.